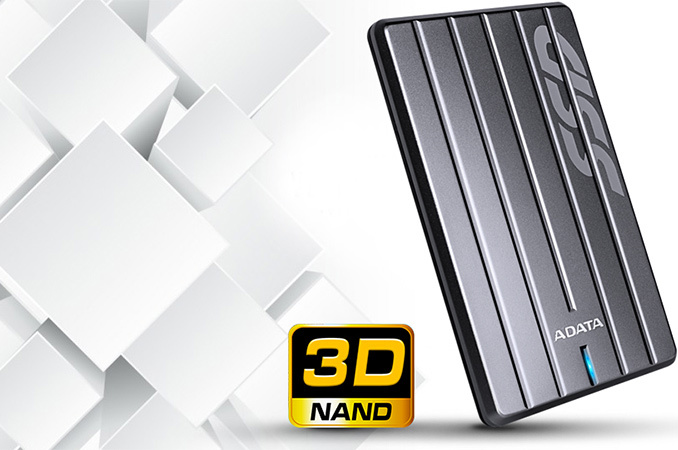 ADATA last week announced its new SC660H and SV620H external SSDs, featuring 3D TLC NAND memory, which are new versions of the SC660 and the SV620 drives introduced last year. The new drives have additional capacity and an additional letter in the model numbers. The internal changes are much more significant than switching the type of memory, as it looks like the SSDs are now built on a completely different platform. Moreover, the fact that ADATA decided to expand usage of 3D NAND for external SSDs seems very noteworthy. It is no secret that SSD suppliers use their desktop/mobile parts with a SATA-USB bridges to build external SSDs. Consequently these external drives inherit all the peculiarities from their ancestors, such as capacity, supported features and so on. The original ADATA SC660 and SV620 packed the Premier SP550 SATA SSD with the JMicron JMS567 SATA-USB 3.0 bridge and thus offered 240 GB or 480 GB capacity. The Premier SP550 is based on the Silicon Motion SM2256 controller as well as TLC NAND flash memory produced by SK Hynix using planar 16 nm technology, which is relatively cheap. The inexpensive controller, as well as widely available TLC memory, made the SP550 as well as the SC660 and the SV620 very affordable and relatively popular. The new ADATA SC660H and the ADATA SV620H share chassis design with the SC660 and the SV620, but their internal architecture is completely different. The new drives are based on 384 Gb 3D TLC NAND memory chips made by Micron/IMFT and come in 256 GB and 512 GB configurations. Given the capacity points, it is highly likely that the new drives integrate ADATA’s Ultimate SU800 SSDs featuring the Silicon Motion SM2258 controller. Performance of these such drives is limited to 440 MB/s sequential read speed (as conditioned by the maximum real-world transfer rate of USB 3.0 interface due to overhead incurred by 8b/10b encoding), just like in the case of ADATA’s rugged SD700 SSDs. Following the announcement of the SC660H and the SV620H drives, ADATA removed their predecessors from the list of its contemporary external SSDs, which may be an indicator that the parts have been discontinued and will only be available while the stocks last. As it appears, three out of four consumer external SSDs from ADATA are now based on IMFT’s 3D TLC NAND. The latter promises to offer a bit better endurance and a bit higher performance compared to 2D TLC NAND, but keep in mind that the real-world USB 3.0 bandwidth rather than NAND or even the controller limits the performance of ADATA’s contemporary external SSDs. Recently Micron said that it had achieved a bit crossover between 2D and 3D NAND (i.e., it produces more 3D NAND bits than 2D NAND bits). The company also claimed that that the first-gen 3D NAND was 20 – 25% cheaper to make than the latest-gen 2D NAND on a per-bit basis, which is in line with its expectations revealed early this year. As it appears, it is now cheaper for ADATA to get Micron’s 3D TLC NAND rather than SK Hynix’s planar TLC memory, which is not too surprising given a strong relationship between ADATA and Micron. ADATA says that the SC660H and the SV620H SSDs will be available at Amazon and Newegg shortly, which is logical since the drives use SSDs that are already in high-volume production. As for pricing, the SC660H is $10 - $20 more expensive than the SV620H due to its thinner design and a more durable metal enclosure. 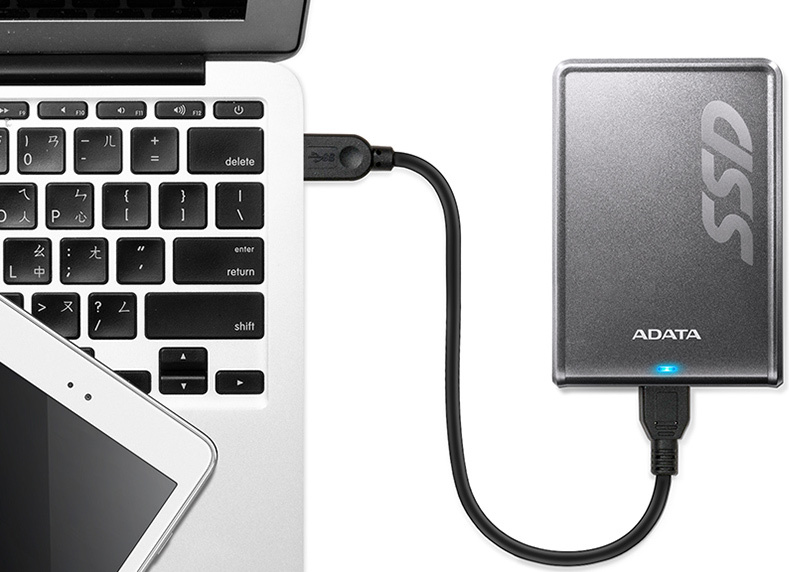 As usually, external SSDs are considerably more expensive than their internal brethren. Upwards of 250$ for 1(one) terabyte? And maxing out at 1TB these drives are only about 4-6 times smaller than they should be as well. SSDs shouldn't be on the market right now for more than about 10 cents/GB and they want nearly 40 for the 512GB model.